Featured as Bon Appetit's Historic Christmas Inn and by Boston Magazine as having the "Best Victoriana" in New England. The Allen House, in the heart of Amherst on over three landscaped acres, is one of the finest examples of stick style Victorian architecture. This 1886, 18 room architectural gem offers seven spacious museum-guality guest rooms with private bath, telephone with modem, ceiling fan and central air-conditioning. A full five course breakfast , afternoon tea and refreshments are served at guests' convenience. Free transportation is provided to and from nearby Amtrak train depot, bus stations and colleges. Rooms are $45-$135 depending on number of people, length of stay and season. No pets allowed. well-behaved children over 10 are welcome. Smoking is limited to outside verandas and gardens. 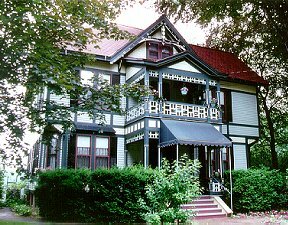 Walk across the street and tour the Emily Dickinson Homestead. Walk to nearby Amherst College, the University of Massachusetts, fine galleries, museums, theatres, concerts, shops and restaurants.